My dad stopped by a few weeks ago and brought me some salmon that he caught on a recent trip to Alaska. When you catch the fish, they basically filet it and flash freeze it so it’s still incredibly fresh when you eat it later. At first, I was going to just grill or sear the fish to really let the fresh salmon flavors shine, but then my creativity got the best of me. I’ve made a lot of fish tacos, but a lot of times the fish is fried which is delicious but not healthy and definitely hides the fish flavor. So I thought I would keep these tacos very simple with just a few toppings. While the Salmon Tacos were absolutely outstanding, what I did with the salmon skin was even better. 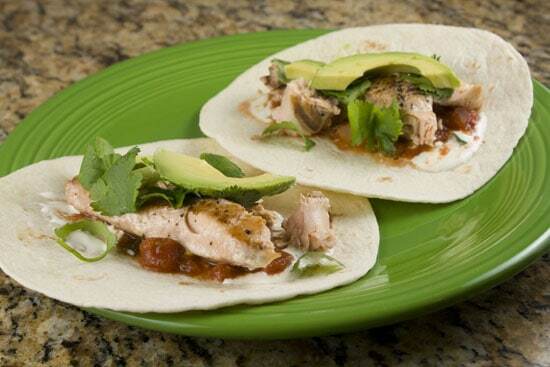 Flavorful and healthy tacos made with pan-seared salmon. 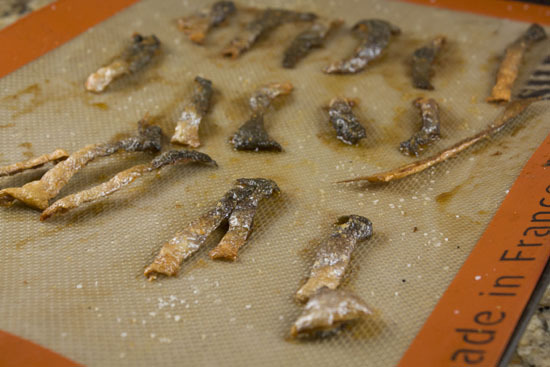 Plus, a bonus on how to make delicious crisps with the salmon skin! 1) For marinated onions, slice them thinly and toss them with lime juice and salt. Let them sit for at least 15 minutes before using. 2) Mix together ingredients for sour cream. 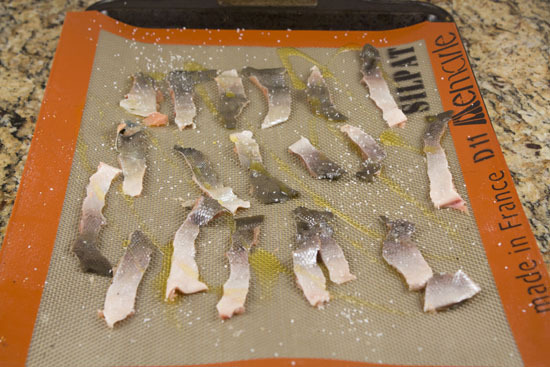 3) Remove skin from salmon and, optionally, cut the skin into strips and lay out on a silpat mat. 4) Sprinkle skin chips with oil and salt and bake at 350 degrees for 10-15 minutes until very crispy. 5) For salmon, rub with olive oil and season well with salt and pepper. Sear on medium-high heat in a large skillet for about 3 minutes per side, until it’s cooked through. 6) Using some small/medium flour tortillas, add a spoonful of salsa and sour cream. Lay in a piece or two of salmon (or some salmon skin). 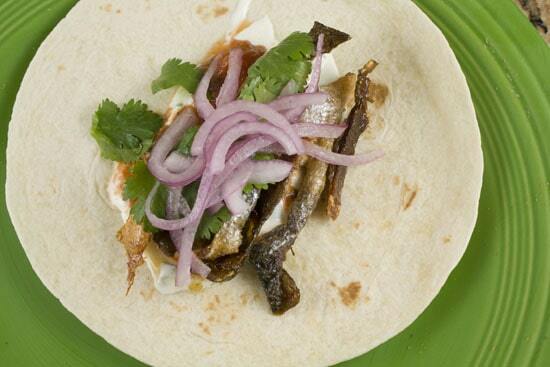 Top with avocado, cilantro, and marinated onions. There’s really nothing to these Salmon Tacos and you can throw them together in under 30 minutes. The toppings are where it’s at though. 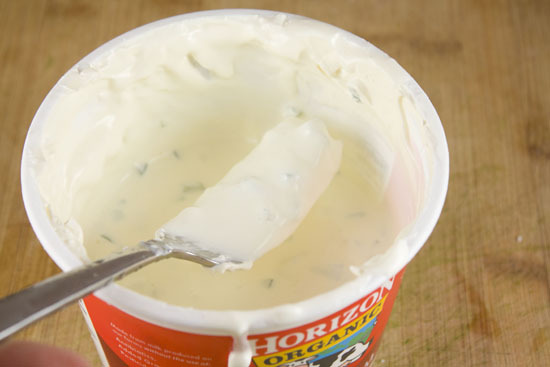 I started by jazzing up some sour cream by adding some fresh jalapenos and lime juice to it. 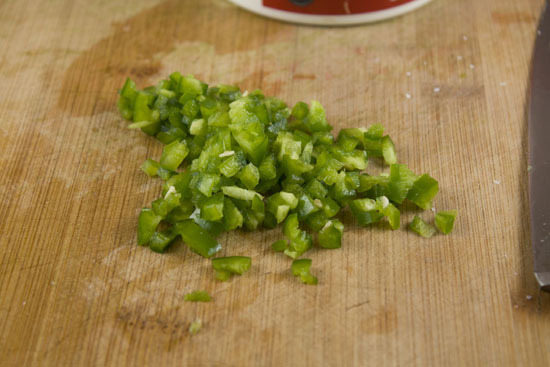 If you want the sour cream to have some some real heat to it, leave the seeds and guts in the jalapenos, otherwise you can just scoop them out before dicing the peppers. Stir these into some sour cream with a squeeze of lime juice. This stuff is fantastic on tacos. 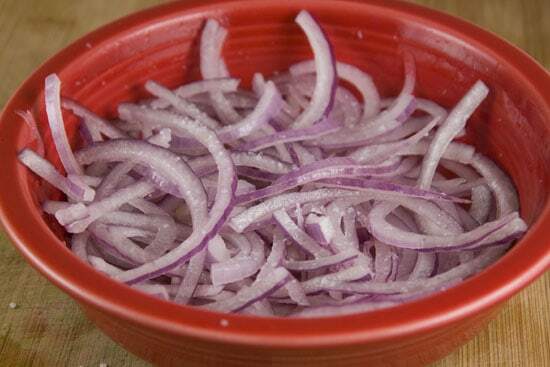 One of my favorite toppings for tacos is simple marinated red onions. The key to these is to slice them as thin as you can. 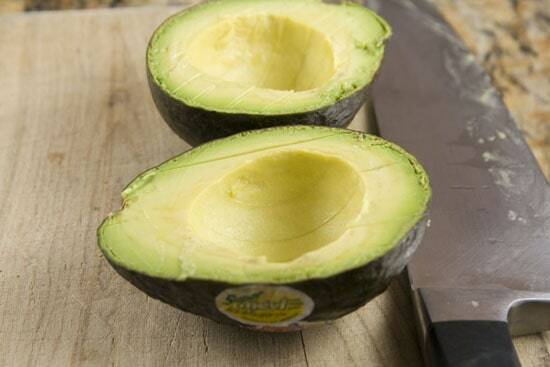 No need to use a professional slicer or anything, but just take your time and get them thin. Toss them with some lime juice and salt and let them sit for a few minutes. The onions will get slightly soft as they marinate and will be really delicious. In my house, tacos without avocados is a pretty big no-no. Salmon comes in many different shapes and sizes these days depending on how you get it. 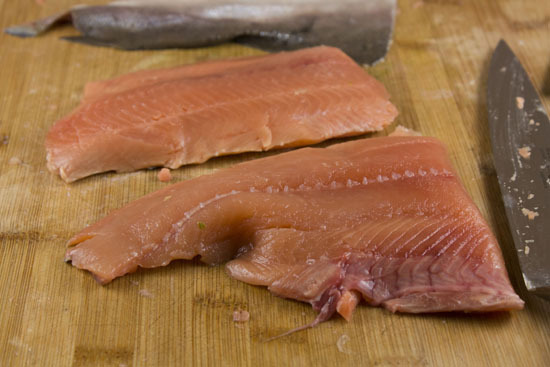 I prefer to buy salmon with the skin on because it keeps it a bit fresher (I think) and I also think the skin is delicious (more on that in a minute). But for tacos, step one is slicing the skin off the filets. This isn’t too hard if you have a decent knife. You can just run it under the filet and the skin should peel off pretty easily. For the actual salmon, just rub each filet with some olive oil and season them well with salt and pepper on each side. Then just sear them over medium-high heat for about 3-4 minutes per side. 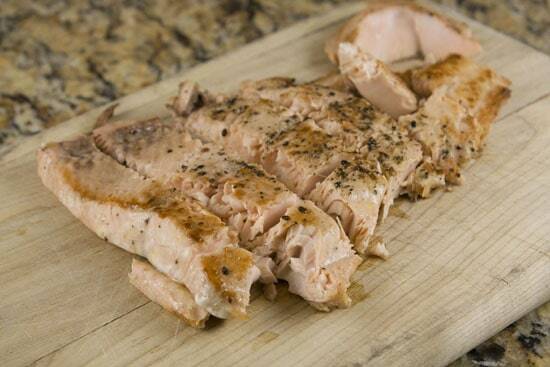 Salmon, like most fish, will cook pretty quickly and you don’t want to over-cook it or it will get really dry. The total time it’ll take to cook depends a lot on the thickness of your filets so just keep an eye on them and start checking on them after they’ve been cooking for 6 minutes or so. When the salmon is done, just dice it up into big pieces that would fit nicely in a taco! Try not to overcook it! The first time I had salmon skin was actually at a sushi place. They were charging like $5 for a roll with salmon skin in it. I thought this was very inventive and a great use for a piece of the fish that most people probably just throw away. Oh… and it also happened to be delicious. It’s one of my favorite rolls now and I order it every chance I get. I quickly learned how to reproduce it at home. The key to doing this correctly is to cut the skin into strips and use a nonstick mat (like a silpat mat). I’ve made these without the mat and they still work (parchment paper is another option), but you really need something like that or they will just stick pretty badly to the baking sheet. So just lay out your skin pieces and drizzle them with oil and give them a good sprinkle of kosher salt. Bake these guys at 350 degrees for 10-15 minutes until they are very crispy. No need to turn them or anything, just let them bake. Normally, I eat these just like this. Little salmon chips! It may sound weird, but they are seriously addictive and use a piece of the fish that most people discard. I think you know the story from here on out. Basically just spread some of that delicious sour cream mixture on a tortilla and maybe a spoonful of salsa. Top with a few piece of salmon, some cilantro, avocado and some of the marinated onions. If you want to get crazy, you can put the salmon skin right in a taco! While I made a few all skin tacos, a better way to do it is to just put one or two salmon chips in with a normal taco which makes it nice and crispy. An all skin taco was great also though. 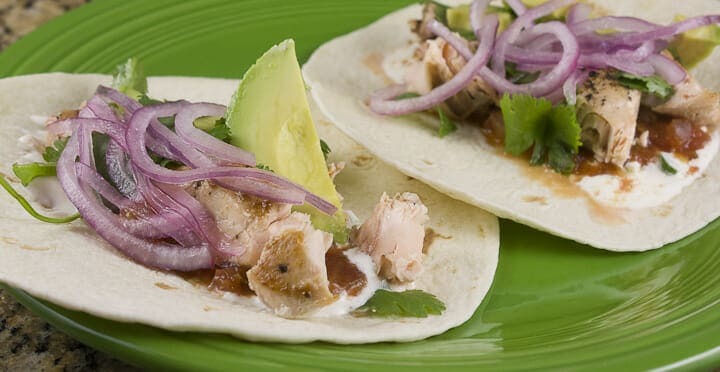 The next time you get your hands on some salmon, consider these Salmon Tacos. It’s about as healthy as a taco can get and is super-flavorful. It’s also a good way to stretch out what can be an expensive cut of fish. But seriously, salmon skin. Sounds weird. So delicious! What if you took a nice big piece of skin and shaped it like a crunchy taco shell? That might be overkill and it would be hard to shape… that said… I think you should try it. This is a great way to showcase the salmon! I suppose those who are concerned about fat and like some crunch on their fish taco, one can add shredded cabbage. Yum, salmon chicharrones. Why didn’t I think of that? Love your blog, always so innovative, but realistic for the home cook. Man! This is an awesome dish that I am SOOO stealing for this week! I can’t do the spicy though (my son will say it’s too sour… LOL) But the rest is right on the money! At this point the fish flakes right off the crispy skin. So, in doing your salmon tacos, I imagine that instead of taking the skin off and baking it separately and then also searing the salmon, you could do the salmon the way I just described and simply flake off the fish and then slice up the crispy skin — kill two birds (fish?) with one stone, so to speak. That said, I do want to try those skin chips! I would think a well-seasoned cast iron skillet would work just fine, skin side down. I’ve never had sticking problems. That sounds pretty perfect to me Brian. You could definitely use that method I think. Assuming your cast iron skillet is seasoned well, it shouldn’t be a problem at all! Nice tip! Have you ever tried making your own flour tortillas? Its kinda of a shame to see such beautiful tacos (all your taco recipes are amazing!) on the sadness that are store bought tortillas. This isn’t a criticism, of course. I can’t make a decent flour tortilla to save my life, and believe me, my sister has tried to teach me.